Alabama junior safety Ronnie Harrison has no need to look back at January's heartbreaking loss to Clemson in the national championship game. Not with Florida State on deck. 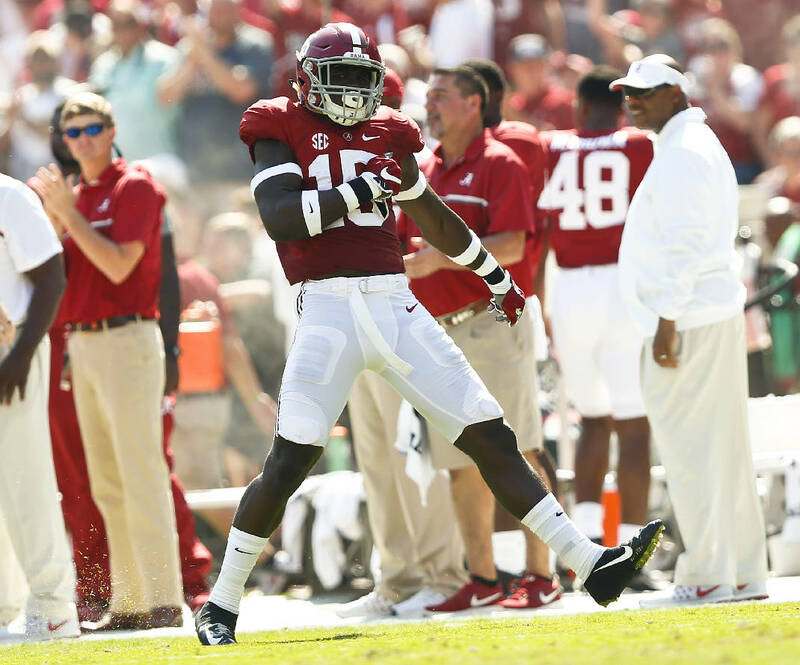 The Crimson Tide's showdown Sept. 2 against the Seminoles in Atlanta's new Mercedes-Benz Stadium is still nearly five months away, but it can't get here soon enough for Alabama's top returning tackler. Harrison is from Tallahassee and took at least five unofficial visits to FSU in 2014, but he committed to the Crimson Tide and enrolled early in 2015. "It means a lot more to me, because I'm playing my home team," Harrison said last week in a news conference. "It definitely helps me prepare for the upcoming season way harder. I'm just ready for it." Asked if he's hearing some chatter back home, Harrison said, "It's already started. You know what they're saying — that they're going to beat us." Alabama held its 10th spring practice Monday, working out for two hours in full pads. The Crimson Tide will practice again Wednesday and hold their second scrimmage Friday. The Tide and Seminoles have met just four times throughout the years, with Alabama holding a 2-1-1 series edge. The last meeting occurred in Nick Saban's debut season in 2007, when Florida State prevailed 21-14 in Jacksonville, but the Atlanta pairing is expected be the first with each team ranked among the nation's top five. Slowing a Seminoles offense that scored more than 30 points nine times last season, including their 33-32 thrilling triumph over Michigan in the Orange Bowl, will be an obvious objective for Alabama, and it may have to start with the secondary. The Tide are having to replace quality personnel at all three levels defensively and have the most returning experience with a secondary that contains Harrison, Minkah Fitzpatrick, Anthony Averett and Hootie Jones. "It helps a lot that we've all meshed together and have that chemistry," Harrison said. "It helps to be out there with people you've played with before. We're probably going to be the strength of the defense this year." Harrison tallied 86 tackles last season and scored two touchdowns, returning a fumble 55 yards against Kentucky and an interception 58 yards at Tennessee. In Alabama's first scrimmage this past Saturday, Averett and Trevon Diggs served as the corners, which bumped Fitzpatrick back to safety. Saban said afterward that the backup defensive backs struggled due to youth, so keeping the starters healthy could be paramount later this year. Harrison wants to help bridge the secondary gap between now and the time he faces his hometown team. "I'm excited, because when I first got here, guys like (linebacker) Reggie Ragland and (safety) Eddie Jackson took me under their wing," Harrison said. "Now it's my turn to show that favor back to the freshmen."